Free legal advice on immigration and other issues will be offered to all interested people on Wednesday, September 26, from 7 – 8:30 p.m., in the second-floor Conference Room at the Princeton Public Library, 65 Witherspoon Street, Princeton. The Ask-a-Lawyer Program started in 1999 to meet a need expressed by the local Latino community: access to affordable legal services. 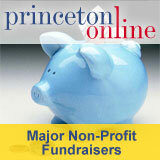 This program is offered quarterly by the Latin American Task Force of Princeton. Local attorneys volunteer their time to provide individual private consultations. The lawyers will answer questions in their areas of expertise and make referrals as necessary. Spanish interpreters will be available. Three Strands is a project started by Lancaster-based singer/songwriter Sean Cox in the winter of 2016. After a five year tenure fronting the Philadelphia-based folk/rock quintet “The Band of Rivals”, He began working on a small collection of songs that, due to their more delicate and narrative nature, fell outside his then band’s sound. The music draws heavily from the American Folk revival as well as early gospel and blues traditions. 101 Scotch Road, Ewing - 609-392-6409 - www.1867Sanctuary.org, $20.